Preheat the oven to 325 degrees F. Line standard-size cupcake pans with 16 cupcake liners. In a small bowl, whisk together the soy milk and lemon juice; set aside until the mixture is curdled. In a medium bowl, melt the margarine in the microwave. Once melted, add in the cane sugar, applesauce, vanilla extract and the soy milk mixture. Sift the flour, baking powder and salt into the wet mixture and whisk together until everything is evenly incorporated with few lumps remaining. Fill the liners three-quarters full and bake until golden and a toothpick comes out clean, about 15 minutes. Cool completely. 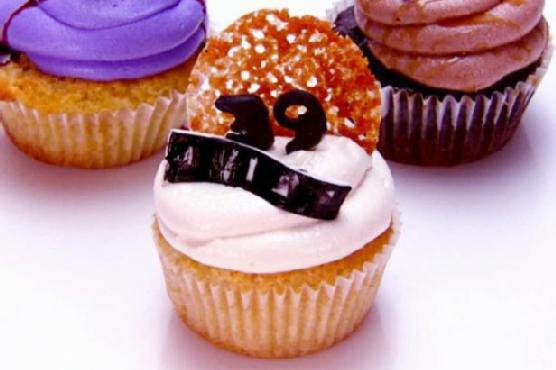 To assemble: Using a large round frosting tip, pipe a generous amount of Creme Brulee Frosting onto each cupcake. Refrigerate the cupcakes until the frosting is pretty stiff, about 5 minutes. Place the raw sugar in a small bowl and dip the tops of the cupcakes in the sugar. Using a small kitchen blowtorch, torch the tops of the cupcakes (the raw sugar part only) until the sugar turns a dark caramel color. Combine 1/4 cup of the coconut milk with the soy milk, cane sugar, tapioca starch and salt. Combine the remaining coconut milk with the brown sugar and vanilla in a small saucepan over medium heat. Bring to a simmer, stirring often. Add the coconut milk/tapioca starch mixture to the pan. Heat over medium heat, whisking continuously until thickened. Transfer the mixture to a glass bowl and set in the refrigerator to cool completely. In the bowl of a stand mixer, cream together the vegetable shortening and margarine until light and fluffy. Add in the powdered sugar and continue to mix until it is fluffy. Remove the creme brulee mixture from the fridge and add to the buttercream. Whip this mixture on high until all ingredients are fully incorporated and very fluffy. Cupcakes on the menu? Try pairing with Cream Sherry, Moscato d'Asti, and Port. A common wine pairing rule is to make sure your wine is sweeter than your food. Delicate desserts go well with Moscato d'Asti, nutty desserts with cream sherry, and caramel or chocolate desserts pair well with port.